Image Size: 21"w x 29"h.
Bow strung and at the ready, this warrior leads his fellow braves into battle. The eagle was considered by Plains Indians as the greatest and most powerful of all birds and he wears one as his headdress talisman for strength and courage in the ensuing fight. 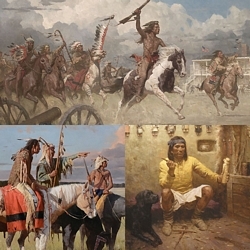 Featured at the 2010 Jackson Hole Auction, "Charging the Enemy" is a stunning Fine Art Giclèe Canvas set in an edition of only 25!